Well my time here has just about come to a close. I have had several amazing experiences this semester in Madrid. I feel so blessed to have had this opportunity. I leave for Dallas on Thursday May 16th. I have a direct flight, which is really nice, and I should land around 5pm Central Standard time. I am not fluent but I have definitely improved. Speaking is much harder then listening and understanding. I can almost completely understand Spaniards when then speak. I have made some great spanish friends and I have discovered great restaurants, bars and clubs throughout the city. I am really going to miss Madrid, I have learned to call this my home. 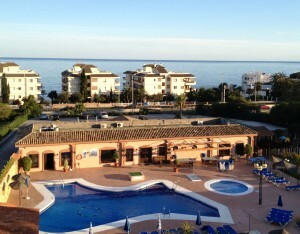 Well for the 5 day weekend my friends and I went to Malaga, which is in the south of Spain, and we had a blast! We went to the beach, went swimming in the pool at our hotel and read books. It was a very relaxing vacation. Last week was the last week of classes and today was our Spanish final. I am happy to announce that I have completed all of the verb conjugations!! This is definitely one of the highlights of my spanish speaking career. If I would have known there were 2 MILLION (an exaggeration of course) verb conjugations I think I would have quit 6 years ago… Anywho, I think the final went well and hopefully I will finish this class with an A or A- as well. My friends and I are trying to do everything and eat everything we cannot do or eat back in the U.S. which is surprisingly stressful! I packed tonight, I only have one big bag to check so in order to fit everything including the new clothes I bought and souvenirs, I am actually leaving some of my clothes here. 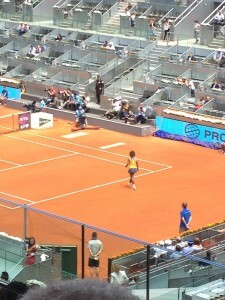 We went to the Madrid open and saw Serena Williams and Federer play! It was incredibly surreal! The weather has been spectacular lately but it is suppose to rain tomorrow and Wednesday, (I think Madrid is going to cry because I am leaving). I am looking forward to some aspects of going home for example, I really miss spicy food and flavorful food. I miss driving around. I miss not having to convert euros to dollars and Celsius to Fahrenheit and Miles to Kilometers and just the whole metric system. I miss English. I miss malls. I miss breathing fresh air without cigarette smoke interrupting it every couple of seconds. Tomorrow is my last day of volunteering at the elementary school, and the kids do not understand that I am leaving 🙁 it is very sad. I have grown to really like those kids and it is going to be really sad saying goodbye to them. Saying goodbye to my spanish professor was actually pretty hard today as well. She was such a fun awesome and amazing professor. She is the best racquetball player in Spain. Our whole class was in spanish and she really helps us translate and conjugate anything. Saying goodbye to Paloma, my host mom, is going to be very sad as well. I am not looking forward to all of the goodbyes I have coming up this week! Speaking of Paloma, she has been teaching me how to cook. This week I learned how to make torltilla de patata and croquetas. Both are very easy and have few ingredients, but all Spanish food is easy to make and has few ingredients. Spaniards are not the best dancers. If a thief steals your stuff and you catch them they will give you your stuff back. I am going to have to think of some more stuff but that is all for now! !